Got banned without any reason given , warnings given and any rules broken . "[01:20] <Rem> We said appeal denied on forum, that's the end of that. [01:21] <Sherlock> See that ^ , when u dont have a reply ; u throw lame excuses." 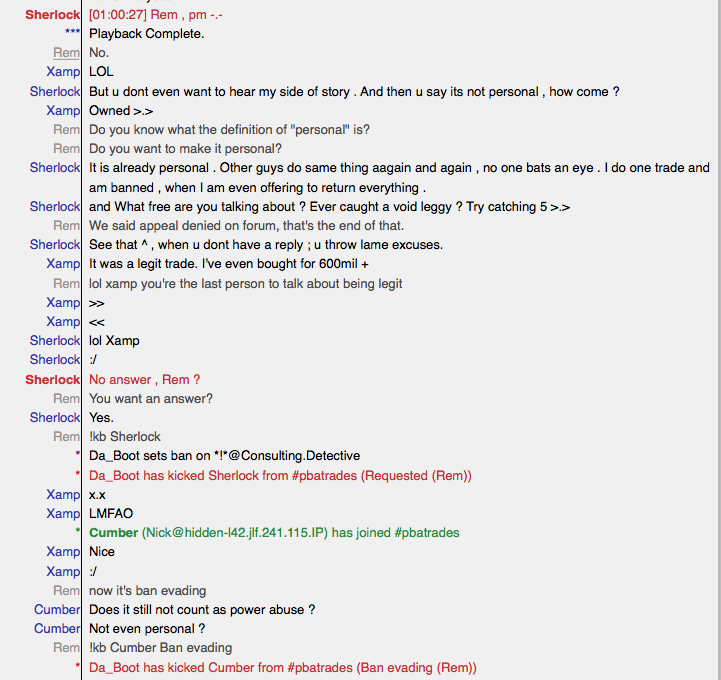 "[01:24] <Sherlock> No answer , Rem ?" jeez you are so innocent. I'm glad you ban evaded several times to show me off. It really works well for you in the end. Good luck with this report Sherlock, you're a valued member of this community and i hope this ends well for you. Cant still see the reason given , warnings given for the first ban . Whats the definition of a power abuse ? As far as evading goes , I still wanted an answer . Wait what , who was showing off ? Me or you ? [10:54] <@Rem> You want an answer? I value the players, just not the scum who abuse the game. I'm done with this little argument, you can cry all you want on this topic. Scum ? Oh wait wait , I did apologise when I was wrong . Tell me , how many times you guys banned me and what actually I have done in these 2 months . Now , I m not even allowed to ask the reasons for it . You cant even justify my last ban >.> . Oh and yea , I heard abt tht lil story when you rather banning a guy , inturn asked him how to bot . Talking abt double standards *cough * . harman19 wrote: Scum ? Oh wait wait , I did apologise when I was wrong . Tell me , how many times you guys banned me and what actually I have done in these 2 months . Now , I m not even allowed to ask the reasons for it . You cant even justify my last ban >.> . And I'll say it again, I didn't ban you in-game, so how can I justify your ban if I didn't place it? The point of ban appeals is to know if you're getting unbanned or not. It was clear you were not, and i rejected your PM but you decided to bring it in the chatroom. That was your first offense. Me saying that it was the end of that, was the warning to stop. You insisted on being stubborn and tried instigating a fight, which in your case, does not help. And the rest is self explanatory, unless you also need a detailed explanation of why evading bans are bad. Good enough for you? Offtopic: I wonder how that story goes and I'm wondering what you know is actually the truth, or just garbage you and your botter friends make up to amuse your boring lives. That was the whole point . U locked the topic denying me the chance to even reason with the mod . If u didnt place the ban ,why poke your nose where it doesnt belong ? Wow , the explaination given for placing the IRC ban . Am I supposed to read between the lines ? We playing some kind of game ? Offtopic : My botter friends ? Lets talk about yours first. Before you start pointing fingers make sure your hands are clean. harman19 wrote: That was the whole point . U locked the topic denying me the chance to even reason with the mod . If u didnt place the ban ,why poke your nose where it doesnt belong ? When a staff member says "No." that means No, not "argue with me" to get your way. Which, obviously, you tend to do. No, you're supposed to read the rules which everyone is expected to know. My hands are squeaky clean, can't say the same about you. Are you done now? I'll lock this topic now because the report has been filed and we'll let the appropriate authorities read it now.